The North American general surgical devices market is expected to register a CAGR of 6.8% during the forecast period 2018 to 2023. The United States dominates the market due to increasing demand for technologically advanced surgical devices, favorable reimbursement policies, and growing investment from public and private sectors in healthcare. Medical device manufacturers in North America, especially the United States, are known for their innovation, and their development of technologically advanced devices. Investment in medical devices R&D has been increased significantly since the last decade in the United States. The R&D spending on medical devices has grown from USD 2.9 billion in 2010 to USD 7.3 billion in 2011. The region is expected to witness increased R&D investment during the forecast period. The growing R&D investment in the region will possibly propel the invention of novel surgical devices, which will drive the market growth. 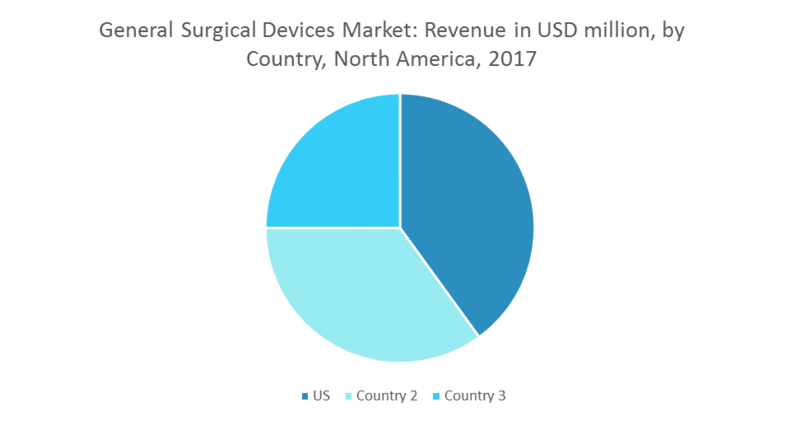 Additionally, growing collaboration between public and private sectors and demand for innovative surgical tools are others factors driving the growth of the North American general surgical devices market. The inefficient, unpredictable, and expensive regulatory processes in the United States are jeopardizing the North American medical devices industry. The US regulatory process consumes more time for approval as compared to other regions. For instance, the devices which need communication with FDA regarding a clinical study for the low- to moderate- risk device before making a regulatory submission, the premarket process for such devices takes an average of 31 months for clearance. In contrast, an average of seven months is required in Europe for clearance of the same devices. Thus, a stringent and long regulatory process and cut down in the reimbursement scenario are also likely to impede the growth of the North American general surgical devices market. The United States dominates the general surgical devices market due to the presence of well-established market players, and rising investment in the technological advancement of surgical devices. An aging population and growing life expectancy in the country are further likely to boost the market for general surgical devices. Mexico is expected to grow significantly during the forecast period, owing to factors, such as growing medical tourism industry in the country and rising healthcare expenditure. March 2016: W. L. Gore & Associates, Inc. (Gore) launched GORE® SYNECOR Biomaterial, a unique hybrid device for hernia repair. January 2017: Ethicon Endo-Surgery, Inc., acquired Megadyne Medical Products, Inc., a private company, which manufactures electrosurgical tools used in operating rooms worldwide. Major Players: B. Braun Melsungen AG, Boston Scientific Corporation, , Cadence Inc. Integer Holdings Corporation, Maquet Holding B.V. & Co. Kg., Medtronic, Conmed Corporation, Olympus Corporations, Stryker Corporation, and Johnson & Johnson, amongst others. 9.7 MAQUET Holding B.V. & Co. KG.